One of the stamps issued Japanese songs popular in musical educations. The illustrator was a commercial animator before becoming an illustrator. His lines and colours are very much suitable for stamp format and on the matured end of ‘kawaii’ kind, for me. Two more female portraits, painted both in 1921, by Yumeji Takehisa, an early Japanese commercial illustrator and book designer. Somehow – maybe it is because the Japanese traditional paintings or wood prints are suitable for being transformed to stamp format – there are a lots of Japanese stamps issued under this category ‘beautiful ladies’. Almost always portraits are made of anonymous female models, posed in front of artists. This is not a category I am collecting stamps, but some of them are quite suitable for stamps. They were my mother’s favorite stamps and as I put on ‘about this blog‘ post, I received a few letters with those stamps on. The artist Yumeji Takehisa was an early example of commercial illustratior and graphic designer, as well as a poet. He was one of first artists who went abroad, tried to open a school for illustration and design. This was painted on rolled silk on paper as ‘hanging’, around 1919. The title of this painting ‘Black Ship Inn’ came from the wodden box the model is sitting on – a sign of an inn named after a large ship from America, led by Matthew C. Perry. This ship, first arrived to Japan in 1853, was the direct force for Edo Shogun to open the counrty. Later, the image of Black Ship was turned positive, as symbol of Westernising and industrial development. The bird lived Southern islands, was certified as Natural monument in 1970. Now it becames one of vulnerable species. I wonder if that is the case for other animal and insect featured in the same series? No voice file is found of this bird – no picture in Wikipedia. I should send this stamp picture, as this is beautifully illustrated. About same time to the last featured bird stamps from Czechoslovakia. Those two birds are known for spring song birds. Choice of brunch, flower and the backdrop colours are somehow very Japanese. Sound of a Japanese Bush Warbler (Uguisu) is evocative for me – Hooo hokekyo! 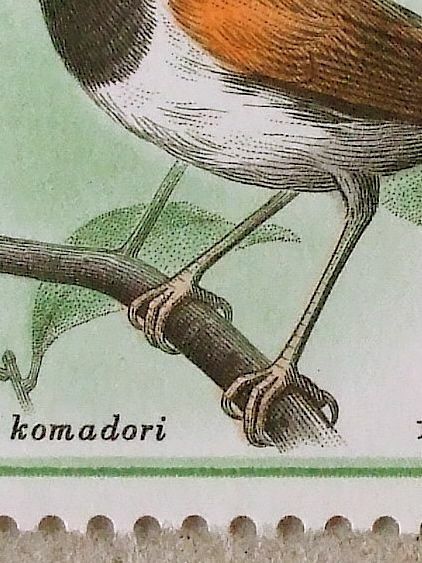 There are a lots of beautiful stamps on birds – maybe the size of birds fits well of stamp format or birds themselves are beautiful anyway, however they are pictured. This fact puts me off from collecting stamps of birds – unless they are nicely designed specifically for stamps. So, the reason why I bought this 60’s set of 7 stamps from Czechoslovakia is because of their highly sophisticated engraving lines and simplified background. Beginning of February – when birds start to sing for their partners and trying to settle their new homes. This little sound article on bird songs helps you to identify what you are hearing. I thought ‘three hearts’ could have been issued for St. Valentine’s Day – although it wasn’t, still makes me happy. Three four-leaved clovers as well. They are engraved by Czeslaw Slania, very crisp and worth looking into them with magnifier.